At RHRLI, we’re very passionate about improving the quality of life for all of our patients. We have a permanent solution to hair loss and thinning hair that we feel will improve your daily life. It’s called the ARTAS® System, and it’s a safe, non-invasive hair transplant that is virtually pain-free. RHRLI and the ARTAS® System, can change your life so we want to let you know about how hair transplants can improve your quality of life. According to the American Academy of Dermatology, the physical and psychosocial symptoms of hair loss can be traumatic to patients. It can impact their self esteem, body image and self confidence. Research has also shown, that the negative quality of life may be worse for women due to the pressure they feel to be more attractive. More recent research indicates that patients who receive hair transplants do have an improved quality of life. 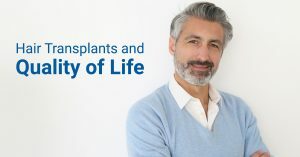 A study indicates that people with hair transplants are viewed as more youthful and attractive than non-transplant patients. The study, published in the JAMA Facial Plastic Surgery Journal in 2016, involved asking questions about people’s perceptions of hair transplant patients. The researchers recruited 122 participants from social media platforms. About 48 percent were men. These observers were then shown side by side photos of two men. In all, the researchers used 13 photos. Seven of the men in the photos were men who had undergone hair transplants, the other six photos served as controls. The survey participants were then asked to evaluate the photograph using metrics such as age, attractiveness, success, and approachability. The participants found that patients who received hair transplants looked about 3 to 4 years younger on average, Fifty-eight percent of respondents thought transplant patients looked more attractive, 57 percent thought they looked more successful and 59 percent thought they looked more approachable. Dr. Parsa Mohebi, one of the co-authors of the study says the results confirm the impact that hair has on patients’ self image. “The results of a hair transplant can restore the self-esteem of a patient, greatly improve his overall quality of life and give a person more self-confidence in social and work situations,” he said. The ARTAS® System can help you get back your self-esteem and make you feel younger and more successful. RHRLI is the only hair loss treatment center on Long Island that offers this revolutionary treatment that uses robotic technology to find healthy donor hairs and places them where they’re needed with top precision. To learn more, contact RHRLI today.